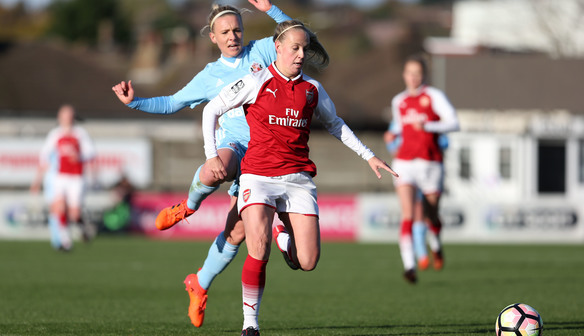 Arsenal’s Beth Mead scored against her former club as the Gunners booked their place in the FA Women’s Super League Continental Tyres Cup semi-finals with a 3-1 win over Sunderland. Jordan Nobbs opened the scoring after just 15 minutes with striker Vivianne Miedema adding a second before half-time to put the Gunners in control. Bridget Galloway pulled a goal back for Sunderland but Mead was able to seal the win in Joe Montemurro’s first game in charge of Arsenal. Heather O’Reilly went close early on for Arsenal and Danielle Carter was inches away from opening scoring when she hit a Miedema lay-off against the crossbar on 13 minutes. And the home side broke the deadlock when Lisa Evans’ excellent cross found Nobbs who was able to turn the ball past Rachael Laws. The home side doubled their advantage before the break as Carter picked out Miedema who placed her free header into the bottom corner. Rachel Pitman and Dominique Bruinenberg both went close before Sunderland, much improved after the break, made their pressure tell as Galloway pulled a goal back at Meadow Park. Carter responded for Arsenal by striking the woodwork for the second time as she hammered the ball against the post from a narrow angle. Bruinenberg came close to an equaliser when her long-range shot had Van Veenendaal scrambling but the ball drifted the wrong side of the post. Evans then came close to an Arsenal third after a neat one-two with Miedema before Mead sealed the victory when she drove a fierce shot into the bottom corner. "I thought our first half performance was brilliant, we kept the ball we played good, football and we looked like Arsenal so it exciting for us. "Second half we needed to better but hopefully that will come in time working with Joe (Montemurro) and getting ourselves back into good form. "He (Montemurro) wants us to play good football, he wants us to enjoy the ball, play with freedom and he's putting the foundations in and we'll progress from there. "Today's performance shows how much we've progressed and kept the ball, I think it was great from us and Joe is a fantastic asset and he wants to win as much as we do." "It was very frustrating to put in a performance like that in the second half but we didn't manage to do it for the whole 90 minutes. I think we had a long hard look at ourselves at half-time and knew we had to be better. "Credit to the girls, we did do that and got a goal and we thought we were in it but with Arsenal's quality they're always in with a shout of scoring a goal whenever. "We knew what we needed to do before the game began and that was purely work hard for each other and have a bit of quality on the ball. Unfortunately there was just a bit missing in the first half."